Okay. 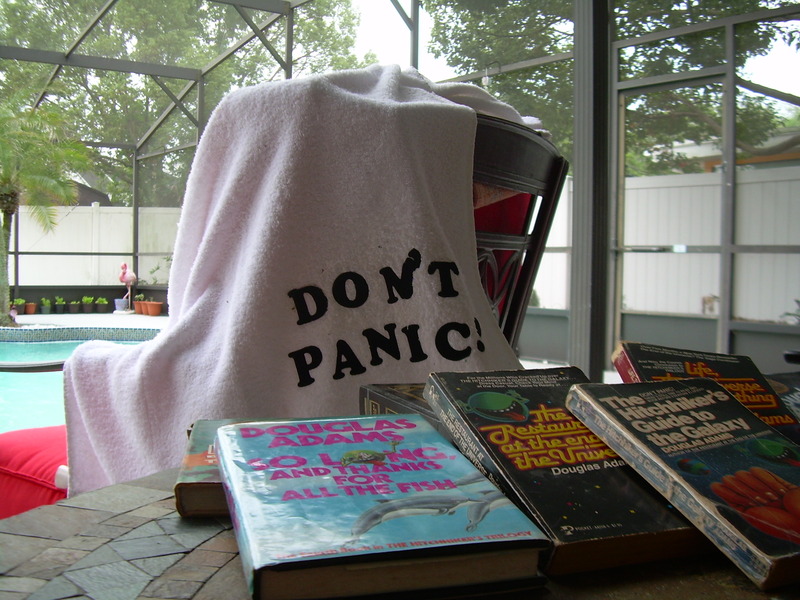 Towel Day is fairly obscure, if you are judging it based on reality, but, as Douglas Adams reminds us in The Restaurant at the End of the Universe, “reality is frequently inaccurate.” (I’ll get back to that.) 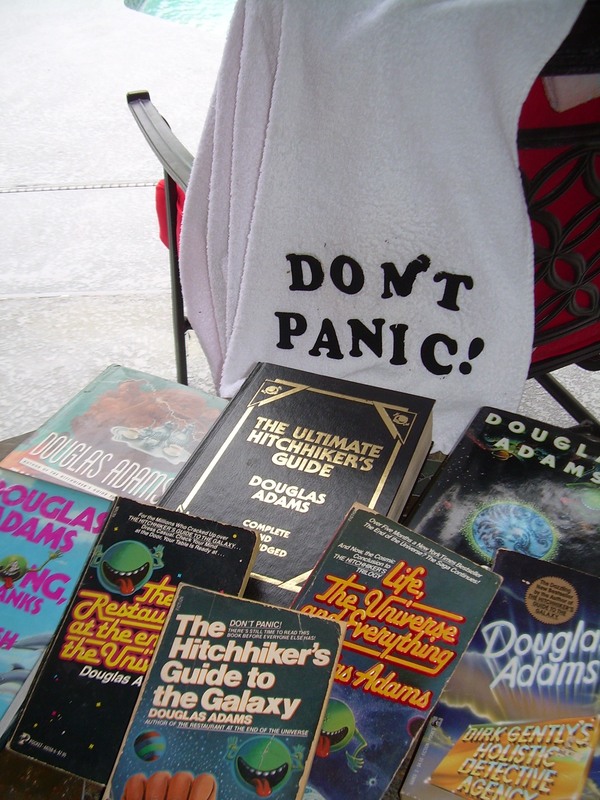 The point is that Friday, May 25, 2012 is Towel Day, a commemoration of the life and work of Douglas Adams, and especially of his book The Hitchhiker’s Guide to the Galaxy. The first Towel Day was held in 2001, two weeks after Adams’ death on May 11. Fans around the world are encouraged to carry a towel with them on May 25th of each year in his honor. Why a towel? Well, if you are acquainted with The Hitchhiker’s Guide to the Galaxy, you know. If not, here is what it says (in Chapter 3) about towels. More importantly, a towel has immense psychological value. For some reason, if a strag (strag: non-hitch hiker) discovers that a hitch hiker has his towel with him, he will automatically assume that he is also in possession of a toothbrush, face flannel, soap, tin of biscuits, flask, compass, map, ball of string, gnat spray, wet weather gear, space suit etc., etc. Furthermore, the strag will then happily lend the hitchhiker any of these or a dozen other items that the hitchhiker might accidentally have “lost.” What the strag will think is that any man who can hitch the length and breadth of the galaxy, rough it, slum it, struggle against terrible odds, win through, and still knows where his towel is, is clearly a man to be reckoned with. Now you know what the Guide says about towels. You can ignore the rest of this because I’m about to get philosophical and impart symbolic meaning to things Adams may not have intended. Yeah, the symbol is the towel and it relates a bit to the quote about reality being inaccurate. I think he’s right — sort of — in a way. It’s not because there is no objective reality. I’m fairly certain there is, it’s just that I don’t think many people actually live there. People wrap a towel of subjectivity around themselves and interpret reality through it. They see things that are not really there (like I’m seeing the symbolism of the towel) and ignore things that are, sure that if they don’t see them, they can’t cause any harm, rather like the Ravenous Bugblatter Beast of Traal. Adams may be pointing out how people filter their perceptions to create personal subjective realities, and I think one of the themes of the book is that we can take these subjective realities far too seriously. Using humor and absurdity, he helps us realize that our beliefs are choices, our perceptions are subjective, and our fears and problems are often simply a matter of how we look at things. Sometimes, our subjective interpretation makes problems of things that don’t need to be, or at least make them seem larger. Shifting perspective may be all that is needed to eliminate a problem, or at least make us feel better about it. On the other hand, I’m probably taking all of this far too seriously, and one thing I think Adams would caution against is taking anything too seriously, especially his books. So, with that in mind, let me just wish a Happy Towel Day to all you hoopy froods. I hope you remember where your towel is, and, whatever you do, Don’t Panic! 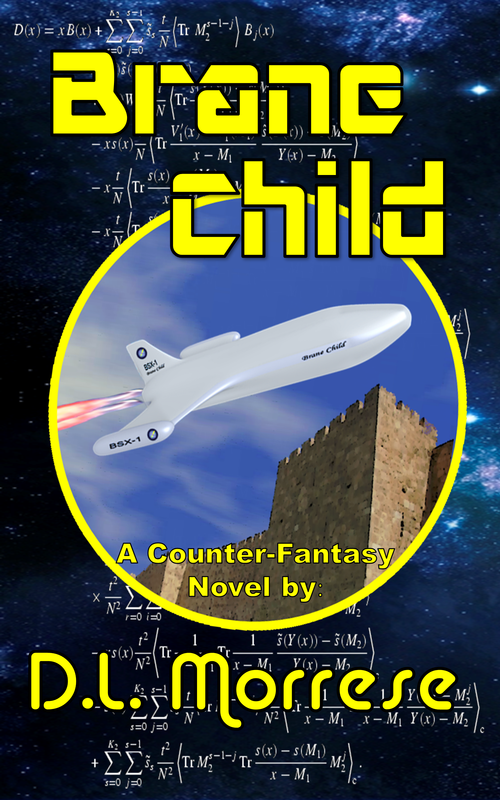 Posted on May 17, 2012, in Science Fiction, Thoughts and Observations and tagged Douglas Adams, symbolism, The Hitchhiker's Guide to the Galaxy, Towel Day. Bookmark the permalink. 6 Comments. Thanks, Matty, and Happy Towel Day. Nice towel! Have a happy towel day, I’ll be blogging to mark it later in the week too!